There you have it folks, on the second of May at the MGM Grand, Las Vegas, the match of the decade is finally happening. It was a nearly six-year wait, but negotiations have ended and the fight was announced Friday afternoon by Mayweather’s camp. Mayweather is Mr. Undefeated (with 26 KOs) and he’s a champion in 5 different divisions. Manny on the other hand won titles in 8 different divisions with a record of 57-5-2 with 38 KOs. They’re both agile fighters who fall within 2 years of each other age-wise. For the fight they’ve agreed on a 60-40 split, the lion’s share going to Mayweather, as well as him getting the rights to be the one to officially announce the fight, after giving notification to Top Rank, Pacquiao’s promoter. Now here’s where things get fun. Pacquiao is a south paw who is known for being swift, aggressive, and packing solid KO-worthy punches… Or at least he used to be. Since losing to Marquez in 2012, he’s been a little bit too careful, losing much of the aggression he’s known for. Mayweather on the other hand is quick on his feet, throws calculated punches, and has near-impenetrable defense. Now his strength can’t be argued with proven by his 26 KOs, but the real problem is his speed and defense, giving him the ability to rack up points while evading his opponent’s strikes. DON’T MISS: IT'S OVER 9000! UFC CHAMP RONDA ROUSEY SHOWS UP AT WRESTLEMANIA! If the last three years is going to be an indication of how Manny intends to fight, it’s highly unlikely he can beat Floyd in the points game. He’s been too careful, fearing another knock out, and that’s not going to win him one of his own. 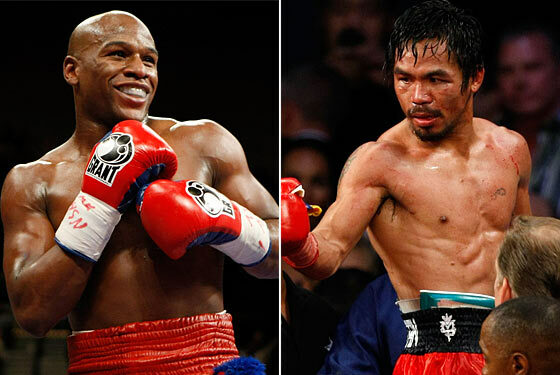 Clearly, the world is going to be split between the two, with (probably) every Filipino on Pacquiao’s corner. The likelihood of him winning though, is honestly pretty slim unless he gets motivated to get his bloodlust back. Everyone wants to see it, and frankly, he really needs it. Pinoys around the world should start showing their support for him and just how much they miss the old Manny. Tweet him, or his camp, share statuses about him, start a tag about him. To make it easy, let’s start with #MannyNeedsaKnockOut because a knock out is a surefire win, and the fight leading to that will give the world the show they’ve been waiting 6 years for. So Filipinos, #MannyNeedsaKnockOut and let’s all help him get motivated to do just that. We miss the old Manny, so show us that fire is still in you. Prove to the haters that you’re STILL the undisputed pound-for-pound fighter in the world.